Texas is honoring the 50th anniversary of its 1963 title winning football team on Saturday against New Mexico State, and as part of the celebration the team will wear numbers above the Longhorn logos on the helmet. The 1963 team, coached by Darrell Royal, the namesake of the Texas football stadium, finished 11-0 and beat Roger Staubach's Navy 28-6 in the Cotton Bowl for the university's first title. 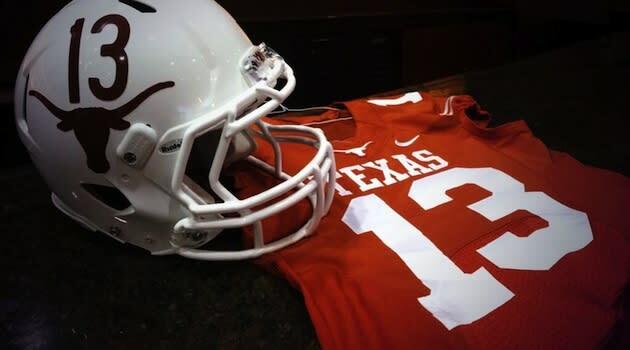 The Longhorns wore numbers on their helmets in 2009 when they played Texas A&M. However, there's a chance that these helmets will be around for more than just New Mexico State. Coach Mack Brown said he's going to let the team vote on wearing the helmets for the entire season. Hopefully the team votes "Yes." Numbers on the side of helmets never get old, and given that it's the 50th anniversary of that 1963 team, the celebration should be extended for the entire season. And if it is and the Longhorns win the 2013 championship? Those numbers may never leave. And don’t forget to join our pick’em league for college football braggin’ rights by entering group code 9970 and password Doc Sat.